A social physical fighting game created just for fun in Unity, as part of an experimental games project. This project was Pixical, a collaboration between Wytze Kamp and myself. Pixical was a way for us to escape the seriousness of our school projects. The name is a very bad reference to the fact we wanted to make digital games with a physical component. A few quick experiments were made, but we quickly noticed that it was kind of hard to test these. Every game we made seemed to require a larger amount of people. When we started we needed about 4 people for our first test, but we ended up with a game concept that needed anywhere between 16 and 70 people. 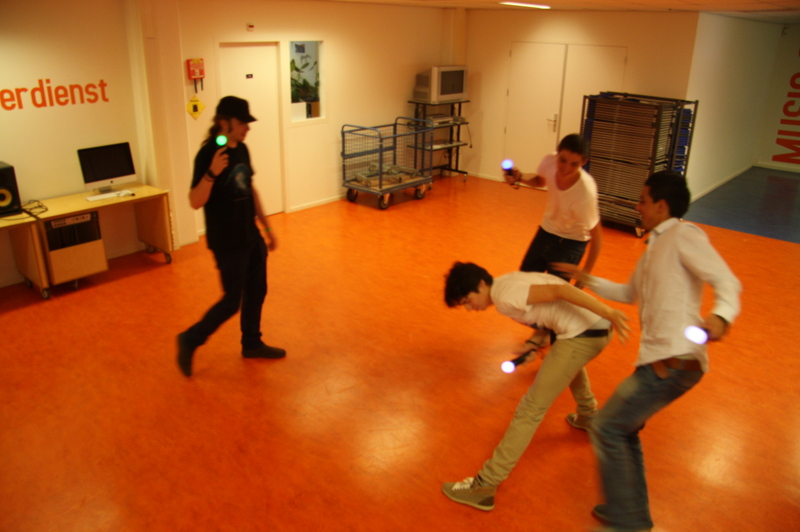 The concept was a screenless PS Move game called DragonBrawl, where groups of people tried to hit each others controllers to steal people from other groups. The twist here was that the people in a group had to hold hands in a line and only the first person of the group had a controller. When your group’s controller was hit it would glow white and another group could steal a player by pressing the buttons on their controller. The controller of the team that lost a player would glow in the color of the team that stole the player. This concept seemed virtually untestable. During bug testing we had 3 to 4 people hanging around so we got them to help. We wanted to make the bug tests realistic so we just had people run around and hit the controllers. This got really intense and had people working up a sweat, but they were definitely enjoying themselves. Gathering 4 fresh people to playtest a game is hard. Gathering 16 is nigh impossible, except if you have something like a big event to test at. This is where we thought we had found a solution. A few other students from our school were setting up an event called KlaverKade. They had already heard about our game and asked if we could show it off. We made sure to have a working setup and started planning for a big test. We even got fellow student Guido Boogaard in on the thing and asked him to make some kickass sounds and music. When the day finally came we were kind of disappointed by the fact only about 100 people attended, while the event lasted about 10 hours. During the first 5 hours of the event we desperately tried to find people to play, but there just weren’t enough people. This is when I had an idea. I set up the game just as I had during bug testing and I just started challenging some friends. After about 15 minutes people started coming up to us and asking if they could play, because they saw us having fun and they could use some. This is where SuperFencing was born. It works the exact same way as DragonBrawl, but it is all about lives instead of players. Where in DragonBrawl you had players following the controller to show the lives. In SuperFencing all you know is the number of lives you started with and the number of lives people stole, if you paid attention during the game. I kept developing the game using the feedback I got during KlaverKade and I added a few more game modes including SuperKickBoxing, where each player has 2 controllers and can steal his own lives, and SuperTeamFencing, where 2 groups of up to 4 players share a common pool of lives. SuperFencing is in development limbo at the moment. The reason for this is the fact that it is a game that can’t be played in a living room, the place where most consoles that can use a PS Move reside and Sony does not seem too keen on opening the controller up to other platforms.